New week, same old weather. It was cold and snowed again a couple of days this week. Most of the new snow melted the same day and some of the old snow is finally melting away. Forecast is calling for 5 - 8 inches of snow from Saturday afternoon to Monday morning. Right now (Saturday morning) the wind is howling which is a good thing because it is pushing the bulk of the snow south. Central Minnesota is expecting between 12 and 18 inches of snow this weekend. My brother was sick last Sunday; he thought it was food poisoning. Unfortunately, he was wrong as I caught the same thing on Friday and still don't feel very well. All I felt like doing was laying on the couch and reading some comfort books. My Beginner's Chair Yoga class was cancelled for lack of enrollment. So I was switched into Beginning Soma Yoga which was interesting. I bought myself a yoga mat and will be going on Tuesday afternoon until the end of May. After finishing these review books, I got sucked back into reading The Others series by Anne Bishop. I was only going to read Written in Red but couldn't stop until I finished the series again. I hope you and your brother have a better week. Yoga is something I should seriously consider...I need to stop thinking and actually do something about it. Snow...what more can I say? Great books and have a happy reading week. Sorry you and your brother were both sick. That is too bad about chair yoga. I wish there was a class around here for that so I could take my mom, I don't think she could get up once on the floor with regular yoga.Have a nice week! I hope you feel better soon and all that snow melts away! I love reading a good book under a warm blanket when I'm sick. I'm curious about John Scalzi's new book. Take care! Sorry to hear that you are under the weather! I hope the snow misses you. Surprisingly, our temps are up this week and that should (hopefully) melt the rest of the snow. I was on a roll catching up with The Others series, but I've picked up some sci-fi/horror lately and have taken a bit of a break from it. I think I'll read the next one in the series in May. Happy reading! I hope you both are doing better. Oh, I hope you feel better this week...and enjoy those books, all of which are new to me. Thanks for visiting my blog. The Scalzi book looks amazing. Enjoy! Enjoy your yoga class. Our pool class has been doing water yoga. It is fun, very different. I need to keep going with the Mercy series. Ugh this weather. We actually had school called off today due to ice. Hope you are feeling better. I had a bit of a sore throat and was like oh great, I'm getting sick, but thankfully it seemed to pass. Oohhh Aftermath!! I LOVE Kelley's books!! Even if I am behind on a few! Lol! Loving her standalones though! Makes me feel less bad about being behind because it's easy to get caught up by choosing titles at random! Lol! It seems like this is the winer that will never end! I'd like to find a regular yoga class... my SIL was recommending chair yoga. That was the first I'd heard of it. So many interesting books in your stack - enjoy! I love my yoga class. I hope you do, too. How long this winter has been! It went down into the 40’s last night. That is odd. Sorry to hear that you both were sick. I hope you're feeling better. Laying around reading sounds good to me, not the sick part though. :) Good for you taking yoga classes. I need to do something like that to get my body moving. I'm adding How We Roll to my wishlist. 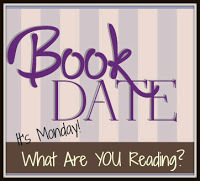 Come see what I'm reading. I'm sorry you and your brother have been sick. I hope you're doing better. An entire series in a week, plus more? That's impressive! Sounds like a really great week besides the snow and such! Go the Others week! Thanks for stopping by! Happy reading! Comfort reads are good at least. Hope you're both feeling better soon! This weather - I am so done with it! I am sorry that you got sick. :( The flu needs to go away too! Aftermath looks awesome! And the Wind Lake Wolves series sounds interesting too. A yoga class sounds really great. I hope you enjoy it!